Well I'm sitting here looking out the window watching a ice storm here in northern Michigan. 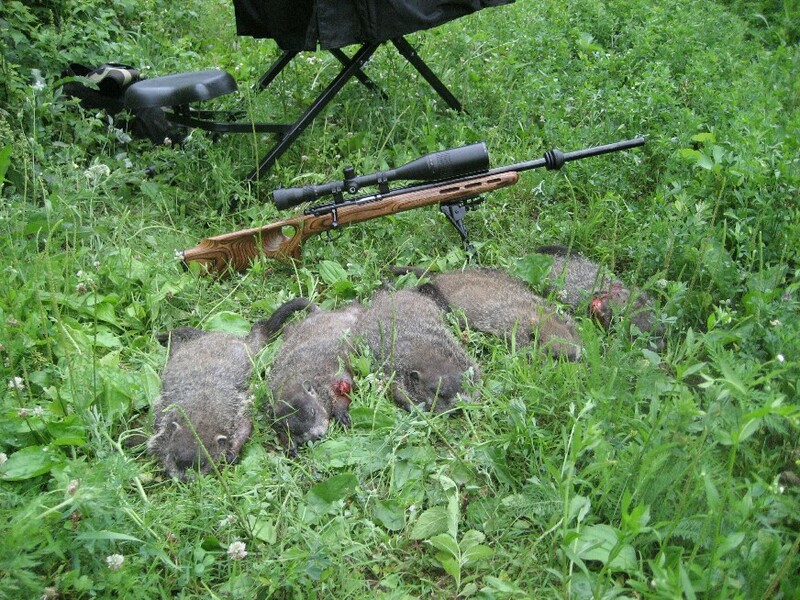 So I decided to show one of my favorite varmint rigs. It started life as a Savage model 10 .223 Sporter I bought used from a friend of my Dad's. Even though it was a great shooting rifle in that form I decided to go to work on it. 1st a Adams and Bennett 221 Fireball barrel.. 2nd a boylds laminate thumbhole stock. 3rd a trigger job and single shot follower. Now its pretty much a bench rifle.. as it's god awful heavy. 40 grain Z-MAX and 14.8 grains of Lil gun is the sweet spot. Accuracy is outstanding. Wacked a few groundhogs around here with it. And hundreds of prairie dogs out west. Nice rig. 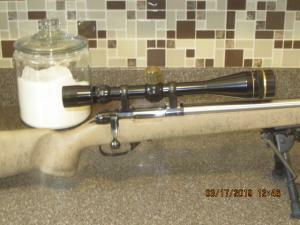 I found the 221 while looking for a quieter ground hog rifle. I hunt on farms that are close to houses and wanted to be a good neighbor. I was looking at the 22 Hornet but wasn't happy about the thin brass for reloading. I read about the 221 and was impressed with the performance using the smaller case size. I found a CZ American that is now my go to rifle. 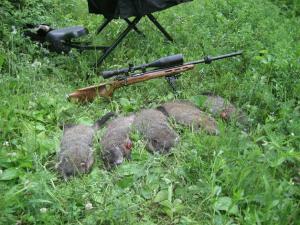 A 40 gn Sierra Balistic tip with a mid range of 2400 powder is deadly on ground hogs out to 300 yards. I can't wait to spring thaw and get back to the fields. What an efficient Little round. You can get some very respectful speeds using little powder. 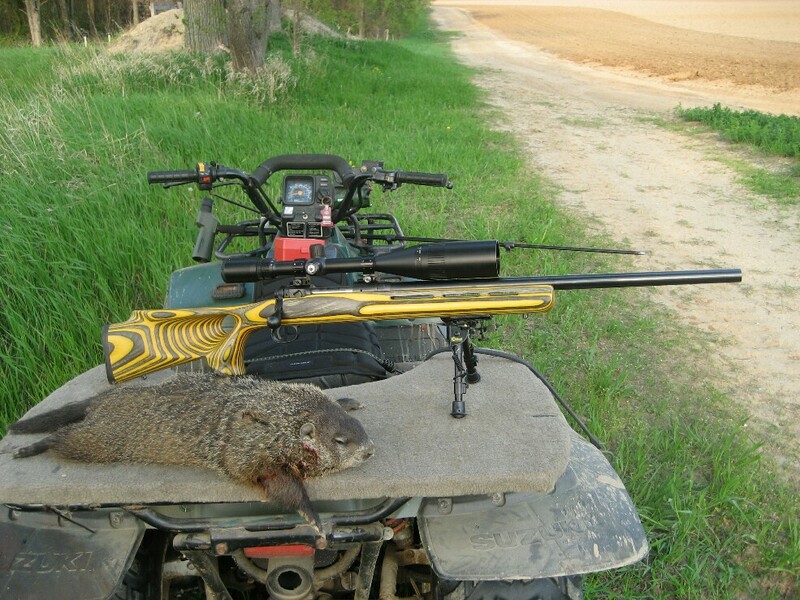 I too am looking forward to spring and the groundhogs getting out to stretch they're legs. Good luck this season friend. Hope to see some pics of your kills. 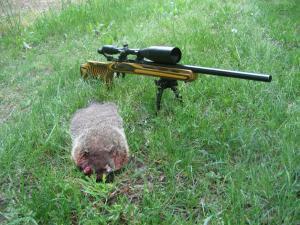 Here's a pic of one I shot with the Fireball using a 30 grain varmint grenade going just shy of 3900 FPS. 110 yards. Quartering away.. talk about hydraulic shock!! Thanks for the pics. That's a nice looking rifle you built. 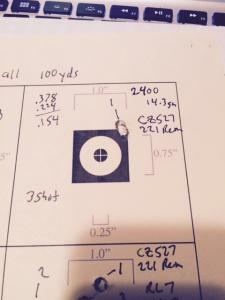 Nosler is making good .221 Fireball brass, other companies too. If you haven't tried it yet, give it a shot next time you need some new cases. It's a good time for owners of the Fireball and friends. 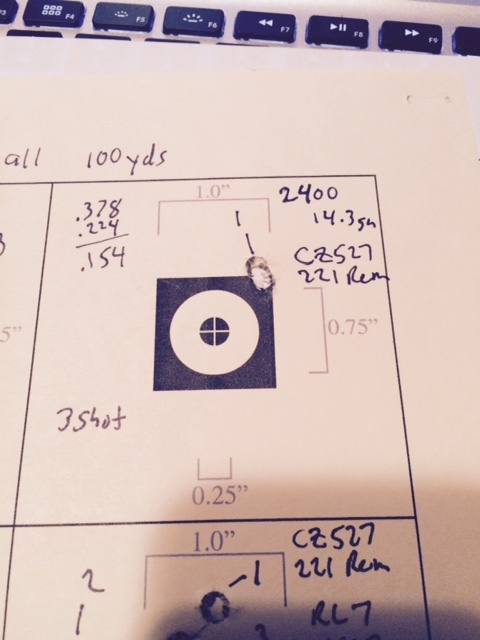 I'll say that I have a 527 CZ .22 Hornet and it's extraordinarily accurate. (i'm always amazed) I took loading advice from Ammoe that requires a little more attention to detail when reloading. I've never fired a factory loaded round through the rifle. While I'm not disappointed in the Hornet, the .221 Fireball would likely have been a better choice. It probably is less fiddly to load with similar accuracy and longer brass life. Additionally on a couple occasions the rimmed case of the Hornet has caused loading from the mag problems when the rim of the top cartridge has slipped behind the rim of the cartridge beneath it in the magazine. In my case I already had .223's and was looking for something significantly different. I'd like to have a .221 to mess with. But the truth is my Hornet barely gets used and the .221 would be the same. If I had groundhogs or prairie dogs/ground squirrels to shoot at regularly that would not be the case. My Hornet has killed a few coyotes. Typically it gets left at home though in favor of some longer range center fire. You may have already picked up on previous posts of mine that I am a huge fan of the Hornet. I have 5 ,22 hornets and a 17 Hornet. Yes the .22 Hornet is prone to splitting necks after a respectable amount of loadings. The 17 Hornet brass holds up much better. But .22 Hornet brass is half the cost of .221 Fireball brass.. no doubt the Fireball is a much Superior round to the Hornet. While not using a lot more powder than the Hornet. 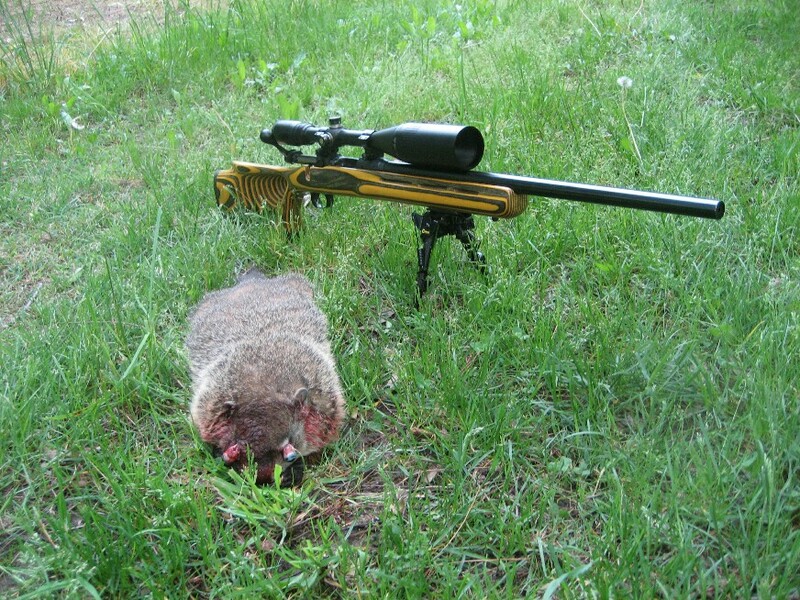 But in my opinion out to around 200 yards the Hornet is a great little round for up to groundhog size vermin. If you own a Hornet (.22 or .17), your best bet it to have the chamber reamed to Ackley specs. The cases will probably outlast you, if you properly anneal them after about 5 reloads. I love Hodgdon's Lil gun! Eleven grains in a .22 Hornet (12.2 in a .22 Hornet AI) are very accurate loads. 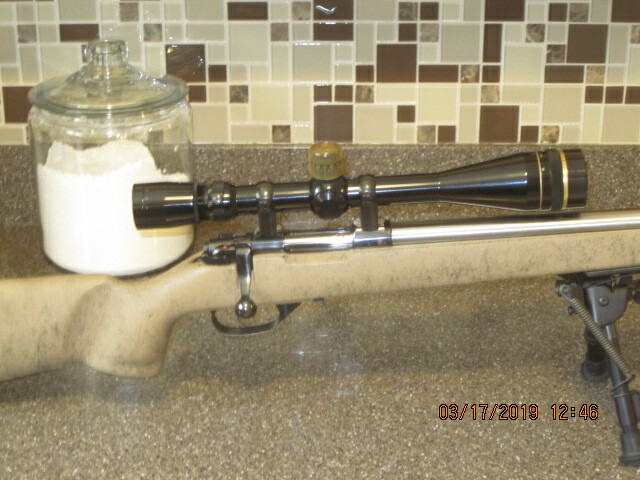 In the former, if you're in the field, you really don't need anything but a funnel and a powder scoop, as you cannot overload the case using Lil gun. Lil gun is magic in my.22 hornets and the Fireball. Have tried many powders in them and Lil gun gives the best accuracy and velocity by far.. not so much in the .17 Hornet. I bought the 17 as soon as they hit the shelf. The only reloading data I could find then was Lil gun. Even at minimum loads they seemed way over pressured in my rifle.. pancaked primers.. fired rounds hard to eject. Being to stubborn to try factory loads I threw it in the safe.. for a couple years.. almost sold it. Then ran across the data for accurate 1680.. problem solved. 11.7 grains behind a 20 gr. Z-MAX @ 3550 FPS.. all good. Also picked up some hodgdon CFE BLK recently. Will keep you posted on my results. Also for you 17 Hornet owners.. a minimum load of 8 grains hodgdon H110. Part of the selling point for the 221 is that I can make 221 brass from the 223 brass I pick up at the range. With annealing will last a long time. I looked at the hornet real hard. At a LGS I held a CZ 527 with a full length stock in beautiful walnut and 22 Hornet for $800. Too pricy for me. I had to pick the Hornet or the 221. (limited funds) The 221 intrigued me. My go to walking Varminter. I drank the purple koolaid a few years back and have twins. . Mini Marx X's in .221 Fireball and 17 Fireball. Both shoot great with low report and great accuracy. Too many cool guns and not enough time to shoot them all. Both of these calibers are worth getting to know. I just got a CZ 527 with a custom hart bbl. In 221FB. I haven't shot it yet, I have brass (Nosler) and dies on the way. I wanted to know what powders you are using. I have RL7 which seems to be popular. I have seen 2400,AA1680,H110 and others most from older loading manuals under the pistol listings. Is there any reason not to use those in a rifle? My bbl is 1-12 twist so I am starting my loading with 40g and 50g Hornady V-Max. The plastic tips look nice but don't forget the soft point bullets; some are tailor-made for the lower velocities of the 221 Fireball and the 222 Remington. Also, you can usually find some really good deals at MidwayUSA, Natchez, Midsouth, Graf & Sons, etc. My 20 VarTarg is formed from 221 Fireball brass and A-1680 is all I have used. Thats a slick looking rifle friend. I've never tried other powders. The above load is very accurate out of my rifle. If it ain't broke don't fix it I guess. P.S. I stated out using 15 grains of Lil gun. 40 gr bullet. I believe that's about Max. Accurate as well. But seemed pressured up a bit. 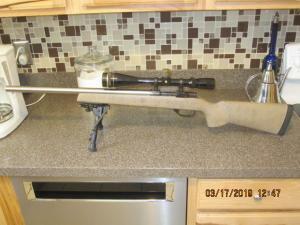 Also used 16 grains Lil gun/ 30 grain varmint grenade.. wicked fast.. Just under 3900 FPS. That load also seemed a little hot to me. Edited by Z-MAX, 23 March 2019 - 04:08 PM. RL7 @ 18.6grs. WSR primer. 50gr BK. Diane's FB shoots this load very nice.